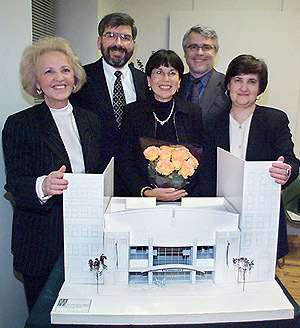 Eugene Shklar (second from left) and his wife Daymel (third from left with flowers) pose with the model of the new Ukrainian Museum with Board of Trustees president Olha Hnateyko (far left), architect George Sawicki (and Museum Director Maria Shust (far right) after a press conference where it was announced that he and his wife Daymel had given $3.5 million dollars for the contruction of a new museum building in New York. Construction is to begin in early 2001. As reported previously on Brama, The Ukrainian Museum is the recipient of a generous $2.5 + $1 million grant for its building fund. The gift greatly eases the burden of fundraising, but as close as the Museum is to achieving its ultimate goal of a new home, it is still faced with the task of raising the $1 million "challenge grant" by the end of 2001, not to mention the execution of the construction plans and a host of other issues that normally accompany the growing pains of an organization's expansion. The Ukrainian Museum was a project conceived and executed by the Ukrainian National Women's League of America (UNWLA). Left with a small collection of some 400 pieces of folk art from a World's Fair exhibition in Chicago in 1933, occasional exhibits were organized by the UNWLA over the years. A proposal later surfaced among the membership for using the collection to establish a museum under the auspices of the UNWLA. The Museum debuted in October 1976 with an expanded collection of about 700 items at 203 Second Avenue. The Second Avenue building was purchased jointly by the UNWLA and the UCCA (Ukrainian Congress Committee of America), and the top two floors were designated specifically for the Museum which it has occupied through today. Daymel Shklar chats with Ivanna Rozhankowsky, former President of UNWLA (1974-1987). The Museum debuted in 1976 during Mrs. Rozhankowsky's term as president. The idea of a repository for authentic costumes, fine arts objects by Ukrainian artists, and archival materials captured the imagination and attention of the Ukrainian community, and donations of folk treasures from Ukraine and valuable works of art began pouring in. Occasional purchases of special items were made to complement the acquisitions, and it wasn't long before the walls of the Museum were bulging with the growing collection. That started the drive to acquire additional space. Today the Museum boasts over 40,000 objects in the key areas of fine arts, folk arts, antique maps and prints, photographs, documents and rare books. Its folk art collection of over 8,000 objects (such as embroidered and woven textile, ceramics, woodwork and metal work pieces from the 19th to the middle of the 20th century), prides itself on being one of the all-inclusive Ukrainian folk art collections in North America. The fine arts collection includes works of such noted artists as Alexander Archipenko, Alexis Gritchenko, Jacques Hnizdovsky, and many others. Photographs, documents, personal correspondence of noted individuals, playbills, and posters, through which the life of the Ukrainian community is recorded, are contained in the archives. At the press conference last Monday announcing the move towards finally building a separate Museum facility, Ms. Hnateyko jokingly assured Iryna Kurowyckyj, President of UNWLA, that "we will soon return the office space to its rightful owners." UNWLA's core operations have been run out of a small rented facility in the area and will claim the two floors of 203 Second Avenue for itself once the Museum has moved to the new location. Mrs. Kurowyckyj offered congratulations for the momentous announcement. She expressed pride in seeing the "museum baby" of the UNWLA grow into the establishment that is today and wished it great success for the new challenges that lie ahead. 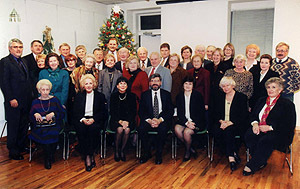 [Click to enlarge] Group photo taken at the press conference on Monday, December 11, 2000. 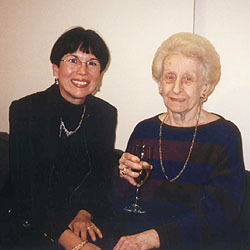 Current UNWLA President Iryna Kurowuckyj stands on the left (in turqouise) behind former President Mrs. Rozhankowsky (seated). In 1982, the Museum became firmly established as an independent entity when it was granted its charter by the Board of Regents of the University of the State of New York. Plans for moving the Museum began to take shape in 1985 with the purchase of the property on East Sixth Street, right in the heart of New York City's East Village. By 1996, the architectural design was completed, although financial constraints prevented the Museum from taking the next step in the progression towards erecting the new building. Valiant fundraising efforts over the years, culminating most recently in the successful "Stride and Ride to Build" bikathon added critical funds to the coffers. But despite generous donations, the rising costs of construction and operational expenses kept the dreams for the new museum at bay. Various alternative plans have been under discussion over time, said Olha Hnateyko, as it became clear that financially the goals for fulfilling the 1995 design plans were more and more elusive. Now, because of the "fantastic gift from Eugene and Daymel Shklar, [the Museum] will be built as originally planned." Making the announcement about the $3.5 million grant, Mrs. Hnateyko's tears underscored the gratitude she expressed to the Shklars for the generous gesture. What does it cost to build and run a museum, anyway? According to Marta Baczynsky, Development and Public Relations Officer, for The Ukrainian Museum, it will take an estimated $6.9 million to raise the new structure. Several hundred thousand more will be required for outfitting the Museum with exhibition and office furniture, collection storage space, and then there must be at least enough funding set aside for the first year's operating expenses. Current operating expenses stand at approximately $350,000 per year, but that figure will rise significantly once the Museum has moved to its new home. More space, more exhibitions, more staff, all add to the costs. Higher door fees and other revenue-generating strategies should take some pressure off the reliance on donors, although cash gifts will always comprise the largest part of the Museum's budget. The property on East Sixth Street was purchased in 1985 for $1.5 million, and the final mortgage payment was made in 1991. An additional $3.5 million has been raised over the years for the building fund. On January 1, 2001, the $2.5 million Shklar grant will be added to that amount. If the fundraising efforts meet the targeted $1 million by the end of 2001, the Shklars will double it (or they will match whatever sum is raised up to the $1 million target) and thus the Museum may have an estimated $8 million to use for building, furnishing, and operating the Museum through the year 2002 - by all accounts, just enough to get by. At the press conference, architect George Sawicki presented a short slide show of the plans for the new building which were drawn up between 1991 and 1996. The new building will have 3 floors of gallery, office and collection storage space, plus a lower level work area with lecture rooms - totaling 17,800 net square feet. The drawings include plans for a street-side café (good, strong coffee and makivnyk, a poppy seed rollade, on the menu? ), a Museum shop, as well as a research library and gallery/auditorium. How does Mr. Sawicki feel about the latest developments? "Elated! When a project has languished this long without progressing, there are serious doubts that it will ever be realized," said the architect. Most projects such as this move forward within a few days after obtaining the necessary approvals from the Buildings Department (the Ukrainian Museum building plans were approved in 1998). Now, with the magnanimous donation that seemingly "dropped out of the sky," there is regained momentum and focus that will drive this project to its long anticipated conclusion. "Realistically," said Sawicki, "the actual construction work can be initiated towards late winter or early spring." There is considerable preparatory work to be done first, including construction contracts that must be put together, reviewed by attorneys and signed, and then subcontractors must be hired and scheduled. All this can take place during the worst of the winter months and it is hoped that work will begin by the end of March. Immediate plans for the Board of Trustees involve determining a realistic and precise timeline for execution and completion of the building which is projected for the spring of 2002. "The first step will be to demolish the structure that stands on Sixth Street," said the Museum's Administrative Director Daria Bajko. Fundraising efforts will be redoubled in order to meet the $1 million Challenge Grant. Anya Hanas Hnateyko, speaking for the Bikathon Committee, pledged to schedule another event in 2001 with hopes of exceeding the $30,000 that was raised last September. And for those who can afford it, "naming opportunities" might be just the ticket - plaques with the donor's name will be hung in the room purchased. Most of the galleries have already been acquired by benefactors, but according to Ms. Bajko, several choice areas are still available for sponsorship. In the meantime, the Museum staff, energized by the recent development, is back to business as usual preparing for the next event. This Sunday (Dec. 17), the public is invited to attend the Museum's annual Christmas Bazaar/Bake Sale and Sing-a-long of Christmas Carols, the perfect opportunity to make a generous donation. Remember - every dollar donated from now until the end of 2001 will be matched by Eugene and Daymel Shklar. Make yours count twice! DISCLAIMER:The contents of press releases on this website represent solely the positions of their respective authors and organizations. BRAMA neither endorses nor disapproves of the views expressed therein. BRAMA retains all final rights as to what may or may not appear on these pages. Anyone wishing to comment on the press releases is welcome to post notices to the News and Politics Comment Board.